Green Tea Plus with Pomegranate - Boost Your Metabolism! At last, green tea with a great taste! Green Tea Plus with Pomegranate is a ruby-coloured beverage with a full-bodied flavour that sets it apart from everyday green tea. It delivers delightful flavour along with all the well-known beneficial properties of green tea. Deligios’ top selections are distinguished not only by their quality and flavour, but also because they contain catechins (the primary antioxidants found green tea). Thanks to its natural antioxidants, green tea protects your cells from damage caused by free radicals, and revs up and supports your metabolism, increasing metabolic rate (the speed at which you burn calories) and assisting with weight loss. Containing powerful zinc and a unique blend of vitamins (C, B12, B6), it increases cognition and alertness, combating fatigue and the other negative effects of oxidative stress. A unique taste which propels you one step closer to your best you! The benefits of green tea stem from its powerful antioxidants: unique catechins that are found in high quantities in Deligios Green Tea Plus. Green tea is the best source of catechins which, according to experts, not only boost metabolism, but also help protect against oxidative damage in cells and strengthen the immune system. Research moreover suggests that long-term consumption of green tea is associated with a reduced risk of osteoporosis and fewer fractures (small or large). Experts believe that green tea helps maintain bone mineral density thanks to its antioxidant and anti-inflammatory properties. These properties also mean that it can speed up recovery from muscle aches or injuries resulting from intense physical activity. 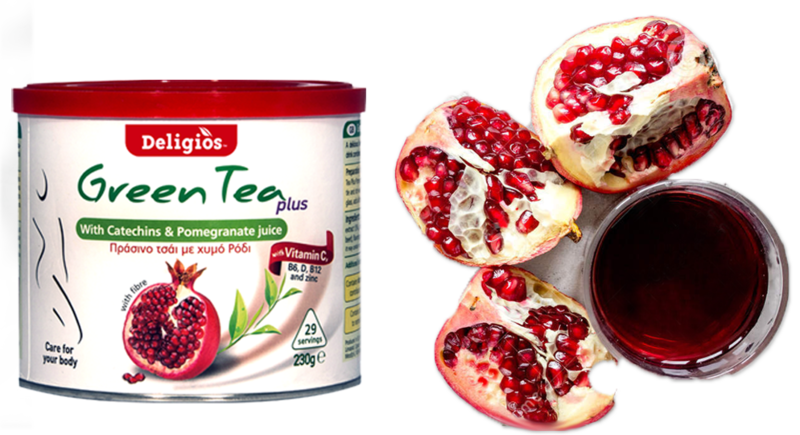 Natural pomegranate juice incorporated into Deligios Green Tea Plus enhances the beneficial effects and healing properties of green tea, while infusing your beverage with a full-bodied well-rounded flavour that makes drinking it a pleasure. Ingredients: Maltodextrin, Fructose, Fibre, Natural Green Tea Extract (5%), Dehydrated Pomegranate Juice (3%), Fruit Juice (Strawberry, Beetroot), Flavorings, Vitamin C, Vitamin B6, Vitamin B12, Vitamin D, Zinc Citrate.